Posted on July 9, 2018 by admin in - WOW! Throughout his work, Keith Haring was never afraid to confront the socio-political challenges of his time. He was an outspoken and ardent activist against racism, homophobia, the apartheid in South Africa and AIDS. Despite that Haring addressed difficult topics in his work, he always approached these subjects with high energy and optimism. He was heavily influenced by graffiti writers and street art in New York City, and created what would become his signature style, composed of the heavy use of line drawing, vivid colors, and simplified humanoid and geometric forms. These glyphs that could be read, like an urban, tribal language were accessible to all, and easy to take in by a wide audience. This week’s Work of the Week! WOW! is Keith Haring’s Fertility #2. Fertility #2 is the second work in the Fertility Suite of 5 works. 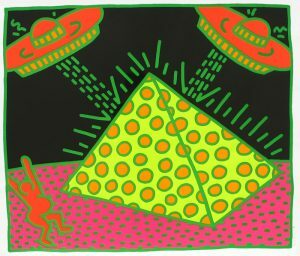 Created in day-glow pigments, the piece is exceptionally bright, which conveys a warm and happy message, and evokes the New York club scene that Keith Haring was a part of. It is a work that captures both the mysteries of ancient civilization with the representation of the pyramid, but also the imagination of extra-terrestrial civilizations through the flying saucers. The pyramid was a common theme in Haring’s work, simultaneously referring to antiquity and symbolizing eternity. It is also connected to the hieroglyphic language that Haring employs throughout his body of work, and the notion that images are a universal language. The UFO on the other hand represents a cosmic energy and suggests supernatural forces or people who were situated outside of social norms. They always symbolize positive energy and empowerment. Lines and circles have a darker connotation in Haring’s work, they refer to the lesions of HIV and AIDS victims. These threats are surrounding a pregnant woman who is in distress, agitating her arms, trying to get attention. Combined, what does all this imagery stand for? In the 1980’s there was a high prevalence of HIV infection among pregnant women in Sub-Saharan Africa. It was a terrible epidemic that devastated vast regions. The 1980’s were characterized by an insufficient response (both in the US and abroad) by government leaders in response to the AIDS epidemic. Ronald Reagan, the US president at the time, did not address the issue until over 21,000 Americans had already perished from the virus. Haring was a staunch activist and leader in promoting awareness about the virus and Fertility #2 is a centerpiece in his fight in relation to the transmission of the virus from mother to child, a particularly common problem in southern Africa. The lesions, or dashes and circles have infected all the land in his depiction of the African landscape, and the pregnant mother is terrified for her unborn child. Keith Haring, loved the hope and innocence of children inspired. To him, they represented a better humanity: color-blind, unprejudiced and caring, uncorrupted by greed and hatred towards others. This work represents the saving of children and human kind from the evils of illness and inactive leadership.